Andre Ethier, who found a groove at the plate during Spring Training, appears to have avoided serious injury after being hit by a Carlos Rodon pitch in the second inning of the Dodgers’ 2-1 loss to the White Sox today. X-rays on Ethier’s right elbow were negative, and he is day to day, as Ken Gurnick writes at MLB.com. Coincidentally, a player who is fighting for an outfield roster spot, Chris Heisey, took over for Ethier and hit his second home run of Spring Training in his next at-bat, off Rodon. The Dodgers set a Camelback Ranch attendance record by averaging 9,804 fans per game, for total attendance of 147,066. By comparison, in their last non-Australia Spring Training, the Dodgers drew 127,876 fans in 16 games (7,992 per game). After getting thrown out in seven of his first 14 stolen-base attempts in 2014 — including three in a four-game stretch from June 12-15 — Yasiel Puig didn’t make another steal attempt for more than two months. He was successful on his final four tries last season, and in his first of Cactus League play this year, he was safe as well, thanks to a fancy slide. Puig also made the White Sox’ Conor Gillaspie look silly for trying to go from first to third on a single to right in the fourth inning today, throwing him out with ease. Joe Wieland allowed two runs in five innings, facing 22 batters. He allowed six singles and three doubles, striking out one and walking none. Jose Abreu went 4 for 4 today, making him 10 for 12 against the Dodgers this month. That’s right: 10 for 12. In Cactus League play, Abreu is 27 for 52 (.519). 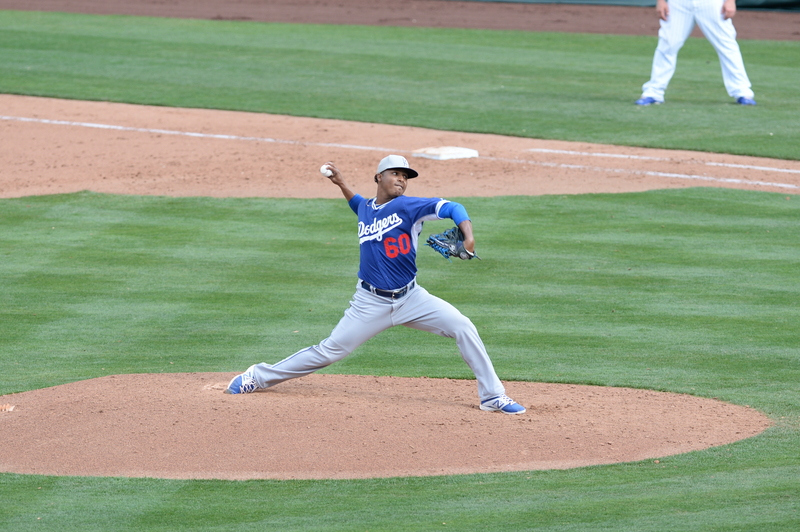 Dodger relievers David Aardsma, Juan Nicasio, Yimi Garcia and Sergio Santos each pitched a shutout inning. Garcia struck out all three batters he faced: Alexei Ramirez, Avisail Garcia and Micah Johnson. Mark Saxon of ESPN Los Angeles has a rich bit of family history on Santos. How Yasmani Grandal and A.J. Ellis are working together is the subject of Dylan Hernandez’s latest piece for the Times. “Much like how Grandal is attempting to learn from Ellis on how to manage a pitching staff, Ellis is trying to pick up Grandal’s pitch-framing techniques — the subtle art of turning borderline pitches into called strikes,” Hernandez writes. Sean Dolinar at Fangraphs posted an interactive graphic comparison of MLB pitching staffs, with the Dodgers second behind the Nationals. White Sox at Dodgers, 1:05 p.m. It might have been the top performance of a Dodger starting pitcher this spring. It was certainly a cool illustration of what the Dodgers’ offseason machinations have wrought. In the Dodgers’ 4-2 victory Monday over Arizona, free-agent signee Brett Anderson whipped through six innings in 74 pitches, taking advantage of the Dodgers’ defensively fortified infield to induce every out via groundball or strikeout (with one caught stealing). Eric Stephen of True Blue L.A. and Mark Saxon of ESPN Los Angeles offer a detailed account of the day for Anderson, whom Don Mattingly called “the picture of health,” knock on wood. Today, Joe Wieland, another offseason import and a leading candidate to shoulder some of the innings that the injured Hyun-Jin Ryu will miss, makes his first official exhibition start after nine exhibition innings so far. Wieland’s last Cactus League game action was a three-inning, 14-batter outing at the Alamodome 11 days ago, so this afternoon’s Camelback Ranch finale (yes, we’ve arrived at that point) stands as a test of endurance and approach, whatever the stats. As valuable as Anderson might be, pitchers like Wieland will play a key role as well. The idea of a five-man starting rotation is a myth. The Dodgers averaged 10.7 starting pitchers per season in the nine-year Ned Colletti era (without even counting pitchers who missed an entire season, such as Chad Billingsley in 2014). The Andrew Friedman-Farhan Zaidi era figures to be little different. The Dodger defense is solid, and there’s offensive depth at every position. If there’s a most likely place for things to go wrong for the Dodgers in 2015, it’s if no pitcher is ready to step in when prime forces like Ryu and Kenley Jansen are hurt. There are going to be games where a starting pitcher blows up or a reliever coughs up a lead, but you just don’t want there to be too many. Wieland won’t quell those fears in a single exhibition start, good or bad. Today simply offers one of many steps for the entire pitching staff toward its goal of providing an overall level of excellence, same as Anderson’s start on Monday. I guess what I’m trying to say is, it’d be nice to see Wieland do well today, even though it won’t mean anything if he doesn’t. For photos from Sunday, visit LA Photog Blog. Dodgers at Diamondbacks, 1:10 p.m. If you’re like Vin Scully, and you think it’s going to be weird to see Matt Kemp suit up for the Padres against the Dodgers on Opening Day in his first official career game for another team, you’re right. Nothing like it has ever happened. In the history of Dodger Stadium Opening Days, no other former Dodger — let alone one of Kemp’s current magnitude — has made his debut for an opponent before Scully and friends. Steve Garvey — the biggest name to go directly from Los Angeles to San Diego before Kemp — was at first base for the Padres at Dodger Stadium on Opening Day 1986, but Garvey was already in his fourth season with San Diego. The highest-profile Dodger ever to play his next game for an opponent on Opening Day at Dodger Stadium was Reggie Smith, who started at first base for the Giants on April 6, 1982 — Los Angeles’ first official game since winning the World Series. Even this couldn’t be considered a big a deal as Kemp. 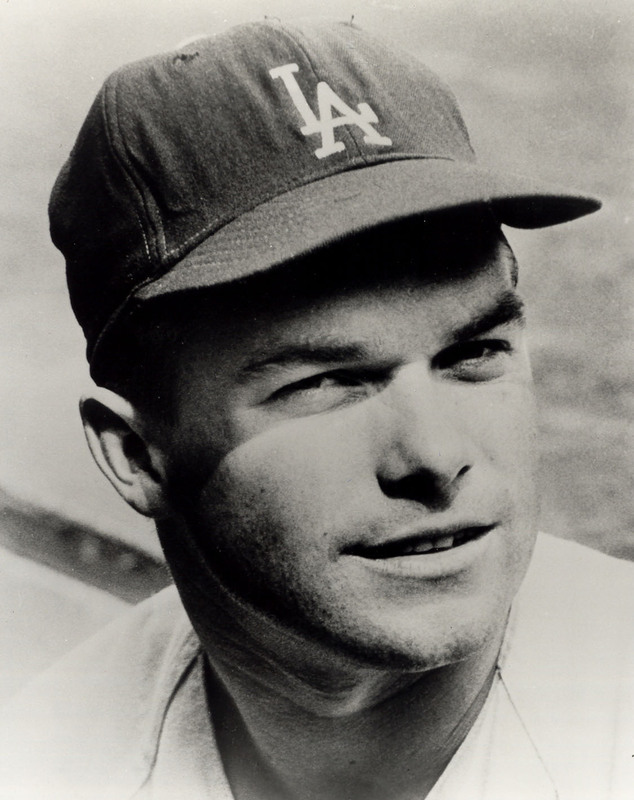 Though revered by this author, Smith was not a career Dodger, and he had already ceased to be an integral part of the team by 1981, collecting seven hits and seven walks the entire year. To find a Dodger regular who played an Opening Day for an opponent in Los Angeles the very next year, you have to go all the way back to a different venue and the very first Game No. 1 played in Los Angeles: April 12, 1960. (The Dodgers opened on the road for their first two seasons after moving from Brooklyn.) That player was Don Zimmer, who had been pushed to the bench by shortstop Maury Wills midway through the 1959 season. That’s not to say there wasn’t some shock for local fans: Zimmer was traded to the Cubs on April 8, only four days before the start of the season, which found him at third base for Chicago at the Los Angeles Memorial Coliseum. 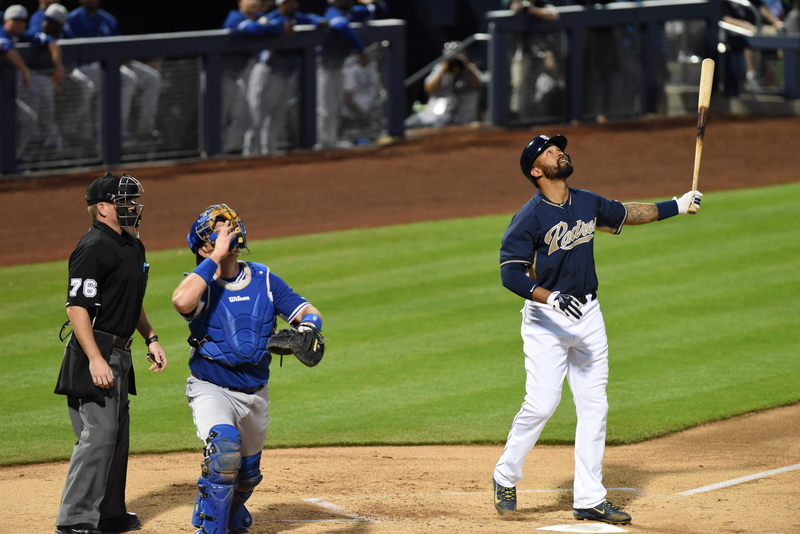 Still, Don Zimmer playing for the Cubs at a Dodger home opener is nothing compared with what it’s going to be like to see Matt Kemp playing right field for the Padres a week from today. Surreal is a word that comes to mind. As Scully put it, the idea of Clayton Kershaw facing Kemp with the game on the line is, for now at least, mind-blowing. Alex Guerrero homered to left in his second at-bat of Saturday’s 5-4 Dodger victory over the Angels, but it was the out he made in the first inning that might be the Dodgers’ most memorable blast of the spring. 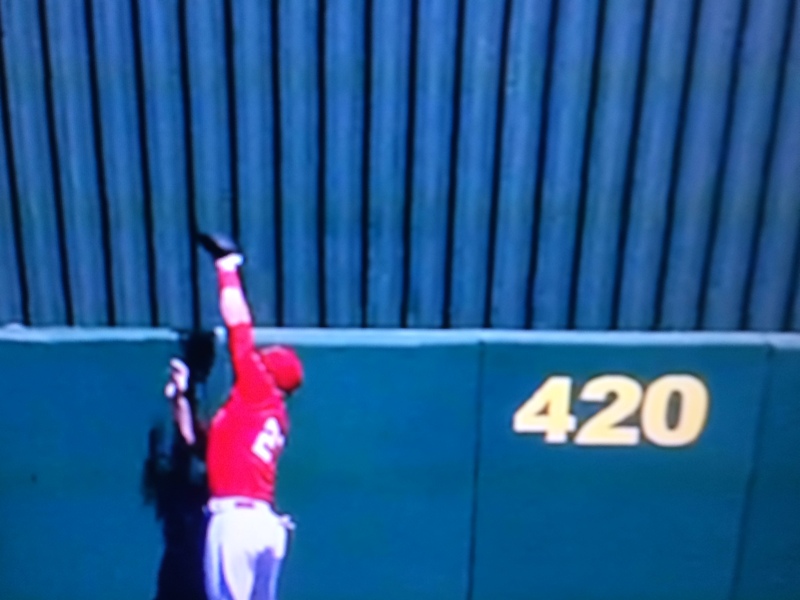 Guerrero, who finished 2 for 4, launched one to the 420-foot mark in center field, only for Angels center fielder Mike Trout to rise above the wall to grab it. Rangers at Dodgers, 1:05 p.m.
One of the big points of discussion emerging after Saturday’s game was whether the pitching of J.P. Howell, David Huff, Paco Rodriguez and Adam Liberatore could encourage the Dodgers to carry more lefty relievers than you’d ever have expected. Ken Gurnick of MLB.com, Bill Plunkett of the Register and Mark Saxon of ESPN Los Angeles lay things out. J.P. Hoornstra of the Daily News has more specifically on Huff. Joe Posnanski tells a baseball integration and acceptance story through the life of former Dodger Bobby Bragan. James Shields, who today was named the San Diego Padres’ Opening Day starter April 6 against the Dodgers, will be making his first career National League appearance — but the right side of the Dodger infield has a friendly history with him. Second baseman Howie Kendrick is 14 for 29 with four doubles, a triple, a homer and a walk in his career against Shields, good for a .500 on-base percentage and .793 slugging percentage. First baseman Adrian Gonzalez is 8 for 25 with a homer and three walks (.379 OBP, .440 slugging). For more images from Friday, return to LA Photog Blog. Dodgers at Angels, 1:10 p.m.
Zack Greinke said he felt fine after his rough outing in the Dodgers’ 8-4 loss to San Francisco on Friday, according to Ken Gurnick of MLB.com, which is all that really matters. Greinke used up his 76 pitches in 3 2/3 innings. An ill-timed error by Carl Crawford, in which he misjudged a high fly, let the first two of five runs in. The veteran righty will next pitch in a minor-league game Wednesday, Gurnick tweeted. That would put Greinke on six days’ rest for his scheduled regular-season debut April 7. Greinke did complete this nifty 3-6-1 double play with a nice stretch at first base. Kenley Jansen gets his walking boot off Tuesday, tweets Eric Stephen of True Blue L.A. Jansen added that he is aiming for a May 1 return to action. The Dodger infield defense looks like it will fulfill its offseason promise, writes Dylan Hernandez of the Times. At Beyond the Box Score, Matt Goldman looks at what Justin Turner might sustain from his breakout 2014 season and what might regress. Chris Heisey’s Spring Training struggles at the plate are the result of having his mechanics out of whack early on and perhaps trying too hard to compensate, writes J.P. Hoornstra of the Daily News. Currently. #OpeningDayLA can't come soon enough. Giants at Dodgers, 7:05 p.m. 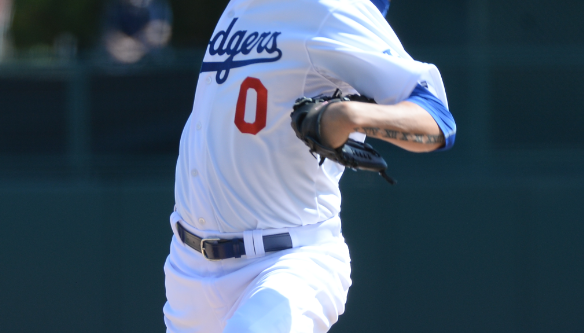 Note: Brandon League is expected to be out of action for months, reports Ken Gurnick of MLB.com. Anyone who knows me — really knows me — knows that if I could be paid to do nothing but sit on a couch and read and watch TV, I would take that job in a minute. But having been commissioned to go into work each day, the ache to make an impact is intense, the reward in succeeding considerable, and the perception of falling short distressful. 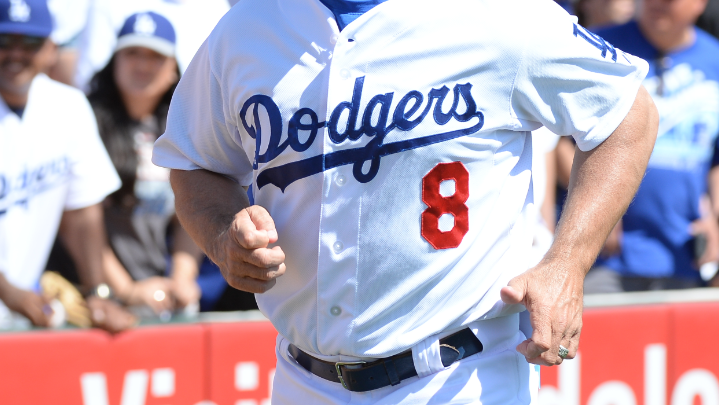 No more than eight Dodgers can be everyday players in a given season, and in reality, the number is maybe half that. Taking health and competition into account, only Adrian Gonzalez, Howie Kendrick, Jimmy Rollins and Yasiel Puig can really know that they’ll have every opportunity to max their potential in 2015 — and even then, there will be probably be bumps and setbacks along the way. For everyone else, there will be days when they want to make a difference, but just can’t. 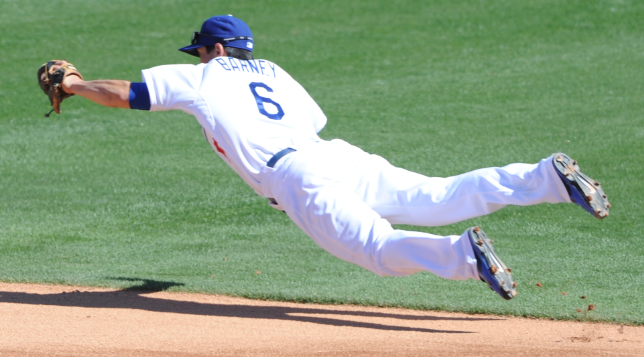 Catchers are not 150-game-a-season players, and certainly not for the Dodgers, with A.J. Ellis and Yasmani Grandal combining two starter resumes into one position. 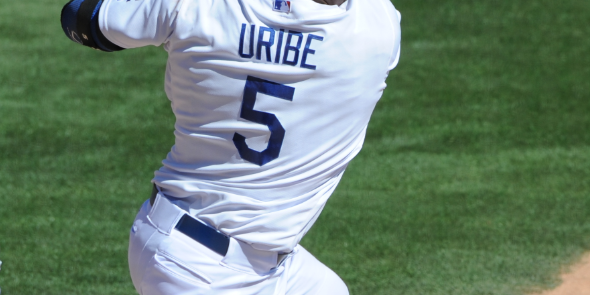 Heaven love the Uribear, but Juan Uribe doesn’t figure to have the legs to shoulder a full season’s load at third base. 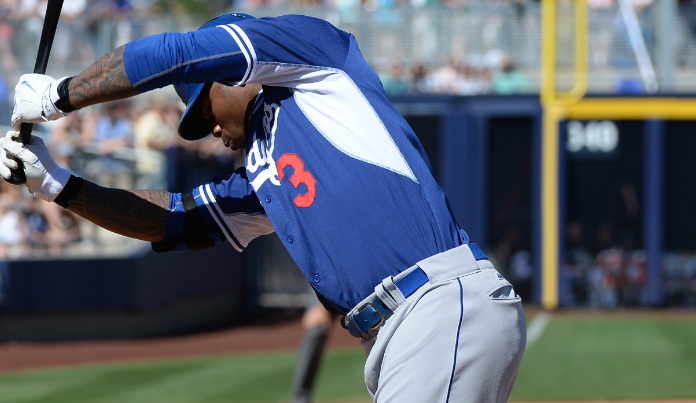 Carl Crawford learned to live with being a platoon player in 2014. Fifty years after Jim Lefebvre made his Major League debut on Opening Day and ended up playing 157 games for the Dodgers, Joc Pederson does have the opportunity to do something similar. Pederson is 22 going on 23, an age where you can be thrilled by your potential, yet unable to possibly appreciate how precious that potential is. In any case, what Pederson’s 2015 will look like remains to be seen. This brings me to Andre Ethier, who is an almost perfect 10.03 years older than Pederson. As the uncertainty over Ethier’s place in the Dodger lineup continues — perhaps nearing a fast resolution, perhaps not — I can’t help thinking how much it must gnaw at him. If you have a belief in yourself, a belief in what you could be doing or what you should be doing, when you’re not fulfilling that vision (however much you blame your circumstances or yourself), nothing easily eases that angst. You need a shot of perspective to channel your frustration into something that motivates rather than deflates. The cynics are lining up against you, the wide-eyed are rooting for you, but none of it matters. You march those moments alone. Baseball is famously said to be the game without a clock (pace-of-play discussions notwithstanding), but deeper down, we know that the clock is very much ingrained in the game. It’s the clock that ticks away a ballplayer’s time in the sun, the fates privately setting when the final buzzer will sound. Outsiders like us pay polite lip service to the player who accepts a reduced role without complaint, as Ethier did in the second half of 2014, but do we also take it for granted? Stomaching your setbacks is so hard. Though I won’t deny that a Major Leaguer’s salary cushions the blow, it’s not about the money. Money reduces stress, but it doesn’t solve for self-worth. I’m not suggesting things can go any differently. In a talented universe, there simply isn’t room for everyone to thrive. You have to go for your wins, stare down your losses, constantly regroup. Some sunsets go quickly, but some linger a beautiful long while. You don’t know which sunset is yours until it comes. 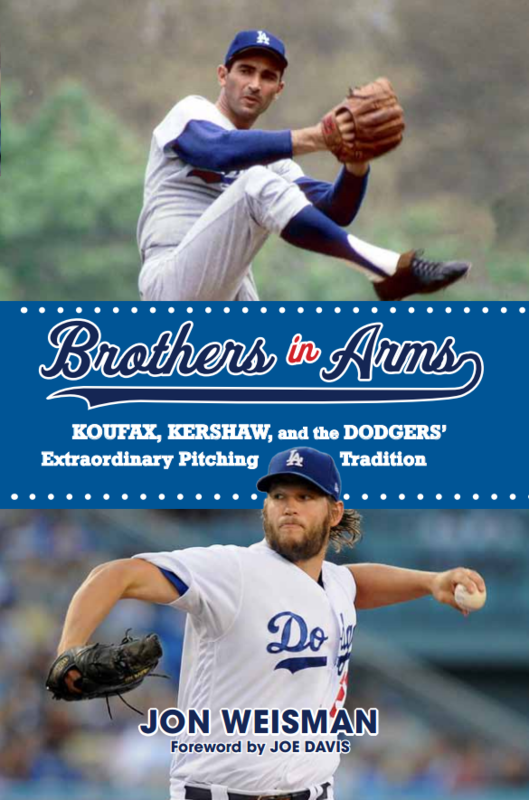 Periodically this year at Dodger Insider, we’ll flash back to 1965 to celebrate the 50th anniversary of that World Series title for the Dodgers. You all know how it ended, but do you remember how we got there? Today, we’ll check in on how things were sounding from Dodgertown in Vero Beach. Opening Day 1965 on April 12 was still about two weeks away, so while the Dodgers were coming off an 80-82, sixth-place finish in 1964, Spring Training’s power of positive thinking was in full swing. This was particularly the case with the pitching staff, as evidenced by two pieces that ran in the Times’ editions on March 28, 1965. 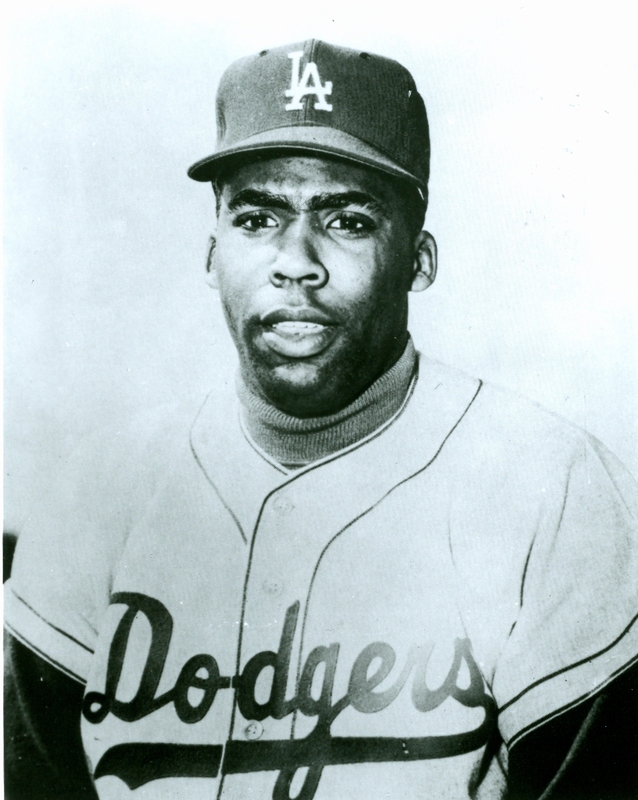 Dodger catcher John Roseboro, entering his ninth season, told beat writer Frank Finch of the Times that the 1965 pitching staff was the best he’s handled. Drysdale threw 321 1/3 innings across 40 starts in 1964. 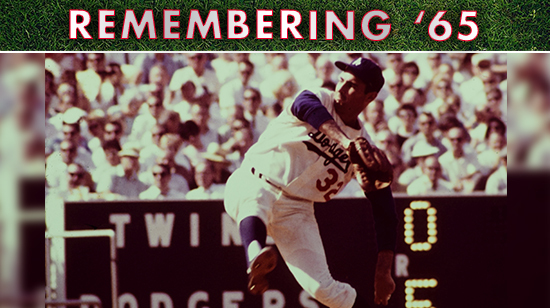 Koufax averaged 7.9 innings per start with a 1.76 ERA, but his 1964 season after a 13-strikeout shutout August 16. Assessing those top two pitchers in the midst of exhibition play, Roseboro was upbeat even if his glasses weren’t entirely rose-colored. 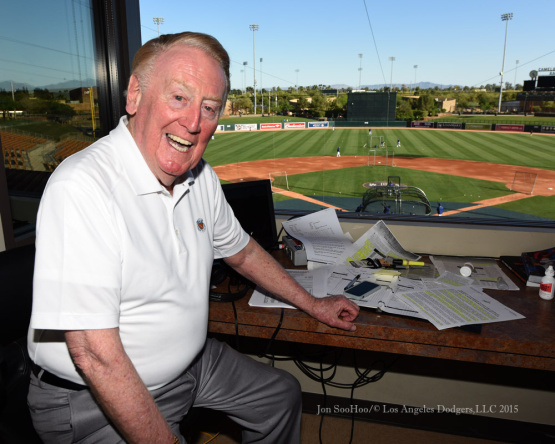 Times columnist Sid Ziff reported even more positivity about the pitching, with a Dodger spokesman telling him it was “by far” the best it had ever been in Los Angeles. Of bigger concern was addressing 1964’s defensive shortcomings. The spokesman didn’t mince words. Parker ended up settled at first base, with Ron Fairly taking the bulk of right-field action. Also of concern was the clubhouse atmosphere and perceived undermining of manager Walter Alston. Leo Durocher, in particular, was famous for challenging Alston’s authority. The idea that Alston, only one season removed from his third World Series title, was so under the gun shows you that it never really gets easy for a manager. But 1965 would indeed prove rewarding for Smokey. 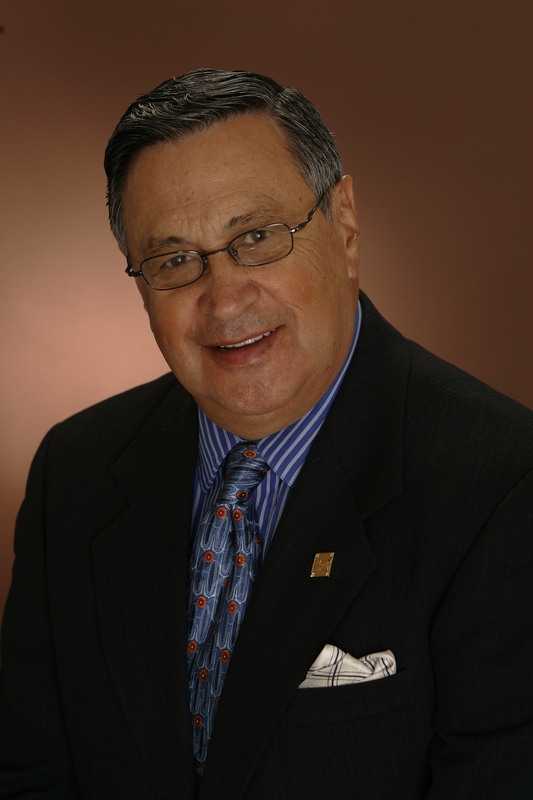 Hall of Fame Dodger announcer Jaime Jarrin will receive the National Leader Award from Servite High School at the fifth annual Excellence in Leadership dinner Saturday at the Anaheim Marriott, for his his exemplary broadcasting career and commitment to help disadvantaged Latino youth receive a quality education. Servite is also establishing the Jaime Jarrin Scholarship for Latino students with leadership potential who need tuition assistance to attend Servite. Jarrin studied philosophy, letters, journalism and broadcasting at Central University of Ecuador. In 1998, he was honored by the National Association of Hispanic Journalists with their highest award, received La Gran Cruz al Merito en El Grado de Comendador (the highest civilian medal) from his native Ecuador and was named one of the Top 100 Influential Hispanics in the United States by Hispanic Business Magazine. He was the first Latin American to win the Golden Mike Award (1970 and 1971). Jarrin will be the keynote speaker at Saturday’s dinner, with more than 600 guests are expected to attend. Click here for more information. In his first start since his dental denting last week, Clayton Kershaw gave up one run in the first inning today, then delivered five shutout innings, striking out eight, in the Dodgers’ 9-6 victory over the White Sox. Jose Abreu went 3 for 3 against Kershaw. The rest of the White Sox were 1 for 19 with a walk. Kershaw also sacrificed twice (once with two strikes) and had a two-out single. After throwing 88 pitches today, Kershaw will scale back for his final Cactus League outing, scheduled on five days’ rest against Kansas City on Wednesday, according to Dylan Hernandez of the Times, before taking his Opening Day start on four days’ rest April 6. The power-happy Dodgers delivered three more homers, including booming shots by Yasiel Puig and Kiké Hernandez and Jimmy Rollins’ first of the spring. Rollins also doubled and had four RBI, and threw out the quick Emilio Bonifacio today from the outfield grass. Chad Gaudin, who missed the 2014 season because of neck surgery, has had a recurrence of neck discomfort, according to Gurnick. Gaudin will have an MRI, the latest in a series following Brandon League (who will have a follow-up exam Friday from Dr. Neal ElAttrache), Erik Bedard and Hyun-Jin Ryu. There was some pregame mischief today with Tommy Lasorda and a golf cart, writes Mark Saxon of ESPN Los Angeles. The Dodgers have sold their 3,000,000th ticket on their earliest date ever, the team has announced. It’s hard not to like Eric Stephen’s bullpen battle flowchart at True Blue L.A. The Dodgers sit fourth in right field and 11th in left field on Fangraph’s positional power rankings. If you can’t get enough overviews of the Dodgers’ top prospects, here’s Jim Callis of MLB.com with his latest. 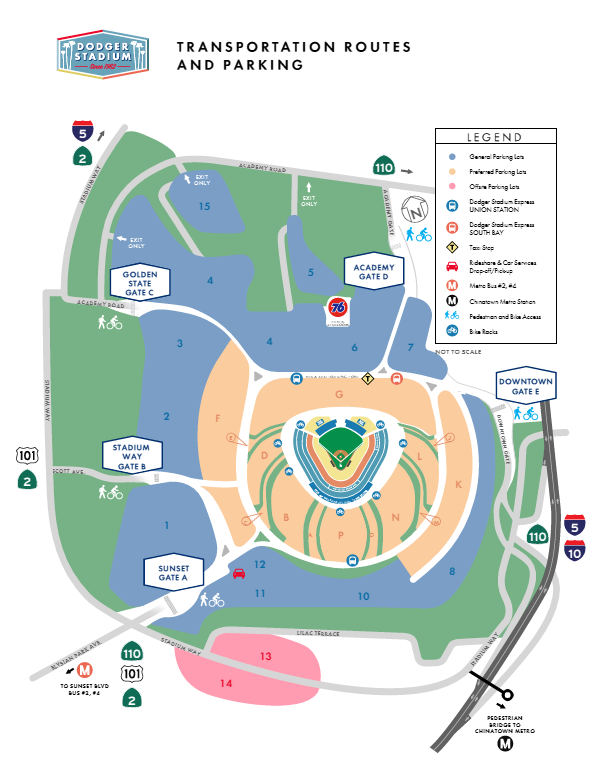 To save money and speed your journey into Dodger Stadium, prepay your parking online. This plan is intended to help accelerate traffic flow into the ballpark. 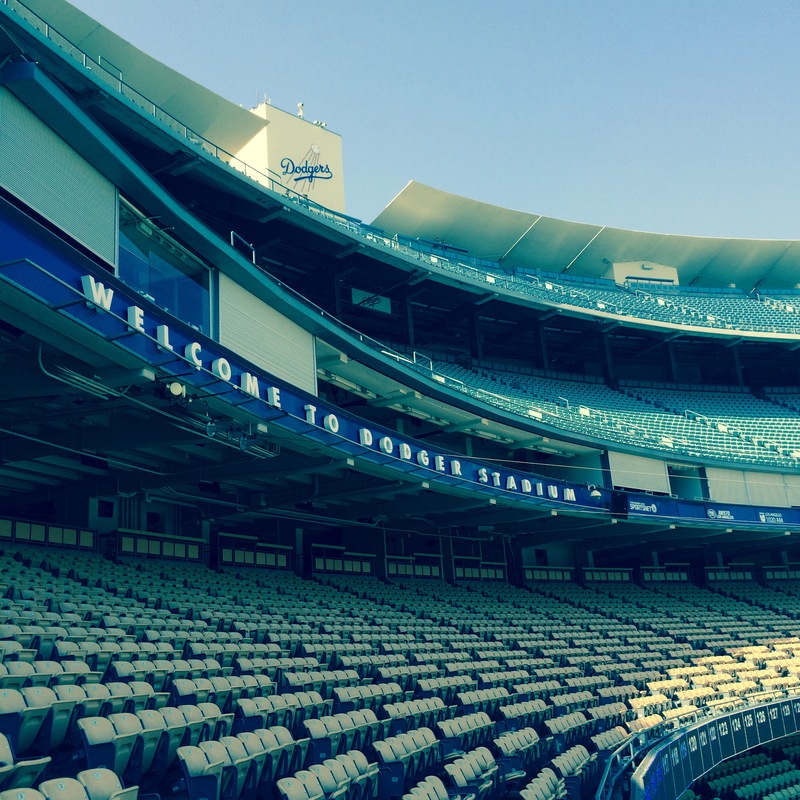 Those with prepaid parking will move through dedicated autogates into Dodger Stadium parking. Visit dodgers.com/parking to purchase parking in advance — including on day of game. To encourage prepaid parking and the use of prepaid parking lanes, general parking is $10 online — same as last year, and available to all ticketholders — and $20 when purchased at the gate. Preferred parking is $35 in advance and $50 at the gate. Please have parking permit (printed, or on smartphone), credit card or cash ready when you reach the autogate. Back on Valentine’s Day, Cary Osborne made the case that the Dodgers should have at least as much power in 2015 than they had in 2014. While the regular season will tell the tale, so far Spring Training has done little to undermine the theory. With four homers today in their 9-5 victory over San Diego, the Dodgers extended their MLB lead in exhibition tater trots with 37, seven more than the Kris Bryant-led Chicago Cubs. Yasiel Puig started things with a monster blast that bounced off the wall in front of the Dodger clubhouse building in the first inning (following, it should be noted, a prime piece of small ball by Jimmy Rollins, who bunted for a base hit). Joc Pederson, Justin Turner and Scott Van Slyke followed with round-trippers. 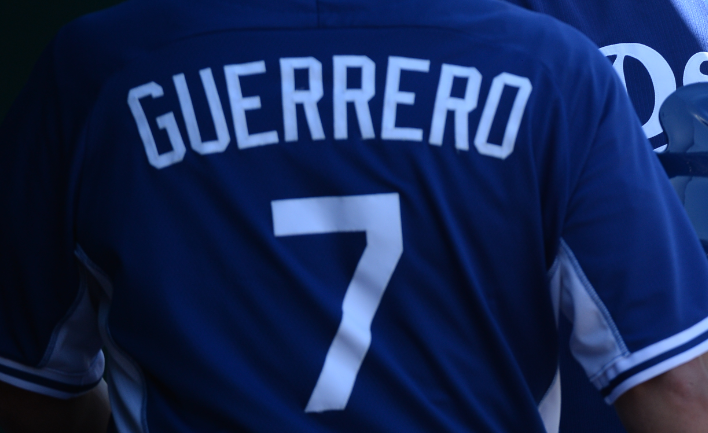 Andre Ethier and Alex Guerrero, sharing the No. 7 slot in the order and left field, combined to go 3 for 4, including two doubles for Ethier. After today’s seven-pitcher bullpen game, Ken Gurnick of MLB.com takes stock of the relievers. Yimi Garcia, among others, continues to turn heads. Stan Conte spoke to Tom Verducci of SI.com about the Dodgers’ new partnership with Kitman Labs to help prevent injuries. Thanks to Mike Adams for bringing the long-lost 0, and helping me remember how old I am. 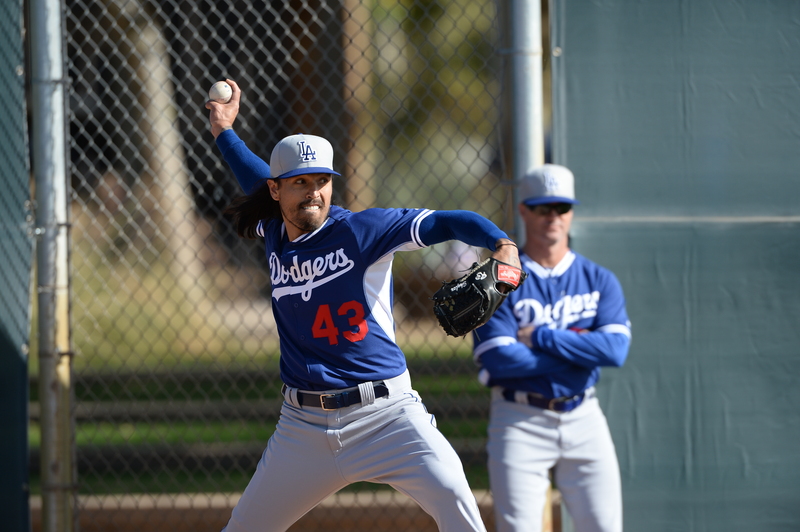 Brandon League is having an MRI done today after experiencing renewed discomfort in his right shoulder, reports Ken Gurnick of MLB.com, and the likelihood has increased that he will join Kenley Jansen and Hyun-Jin Ryu on the disabled list to start the season. League retired all three batters he faced in his first 2015 Cactus League outing March 5, but five of the six batters he faced March 9 scored. He appears to have overworked in a bullpen session two days after that, according to Gurnick, who adds that League has not had a shoulder injury since 2007. The relievers that could take League’s spot on the Dodger roster remain plentiful. In fact, the Dodgers are scheduled to use several of them today in what will be a bullpen game, started by Juan Nicasio, with J.P. Howell, Yimi Garcia, Dustin McGowan, Joel Peralta and Paco Rodriguez scheduled to follow. Pedro Baez, Chris Hatcher, Adam Liberatore, David Aardsma, Mike Adams, Chad Gaudin, David Huff and Sergio Santos are also in the relief mix, without even addressing players who have been optioned, like Daniel Coulombe. Another bullpen game is scheduled for the Dodgers on their final Saturday in Arizona, against the Angels. This is stuff you should know already, but it’s easy to forget when you’re deep in Spring Training. The Opening Day roster is the roster for, like, a day. Maybe a few days. Let’s take a look at what happened last year. We’ll even bypass the Australia trip, which had its own special roster rules, and begin with the Dodgers’ Stateside opener in San Diego on March 30, the day that Clayton Kershaw was officially placed on the disabled list. Placed Brian Wilson on the 15-day disabled list retroactive to March 31 (right elbow ulnar nerve inflammation). Recalled Jose Dominguez from Albuquerque. Activated Matt Kemp from the 15-day disabled list. Optioned Mike Baxter to Albuquerque. Placed A.J. Ellis on the 15-day disabled list retroactive to April 6 (left knee surgery). Recalled Tim Federowicz from Albuquerque. Activated Josh Beckett from the 15-day disabled list. Optioned Jose Dominguez to Albuquerque. Activated Brian Wilson from the 15-day disabled list. Optioned Paco Rodriguez to Albuquerque. Optioned Chone Figgins to Albuquerque. Recalled Carlos Triunfel from Albuquerque. Optioned Carlos Triunfel to Albuquerque. Recalled Paco Rodriguez from Albuquerque. Optioned Tim Federowicz to Albuquerque. Selected the contract of Miguel Olivo from Albuquerque. Catcher, infield, outfield, starting pitcher and relief pitcher all are featured in transactions. Two of the transactions involve players who weren’t even on the 40-man roster after the season began. And of course, there’s always that player who is caught in a revolving door. Jose Dominguez was recalled twice and optioned twice in a 25-day span. In all, only nine players from the 2014 Opening Day roster didn’t go to the disabled list, the minors or another team at some point: Kenley Jansen, J.P. Howell, Jamey Wright, Drew Butera, Adrian Gonzalez, Dee Gordon, Andre Ethier, Yasiel Puig and Scott Van Slyke. Even more zany was the previous April, which included Aaron Harang making the Opening Day roster, then being traded before appearing in a game. (Harang is now with the Phillies, his seventh team in the past 24 months). The 2014 Dodgers added or subtracted 14 different players by April 30, and had employed 35 players on the 25-man roster by the end of the month. 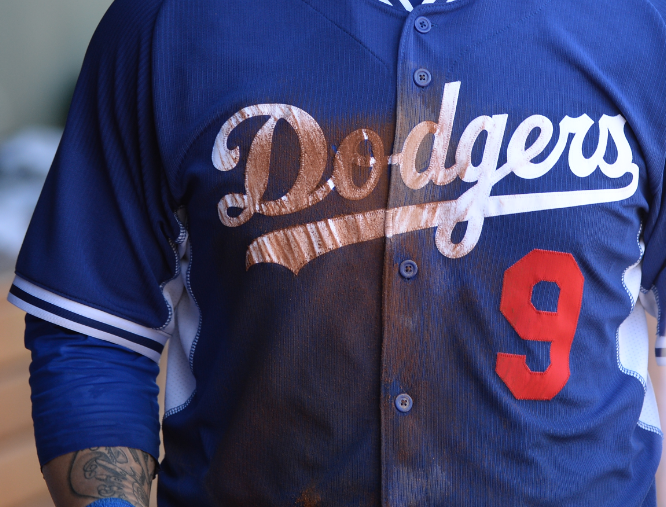 Overall, 73 players have worn a Dodger uniform during a regular-season game since April 2013. During Spring Training, when the games come down to players wearing jersey numbers suited for defensive linemen, there isn’t much more to talk about at night than who will make the initial cut and who won’t. But once things get set, get ready for change.